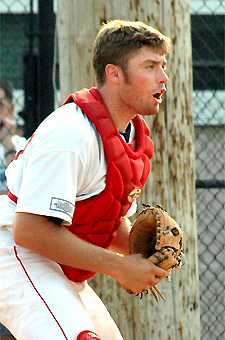 WAREHAM - For the third straight season, a standout catcher has received the Dan Silva Sportsmanship Award. Joel Collins of Wareham follows up back-to-back Hyannis Mets recipients, Chris Robinson and Richard Mercado. Collins who hails from Richmond Hill, Ontario and attends University of South Alabama, received the award before Wareham’s final home game on August 7. The award is voted on by the ECAC umpires, who work Cape Cod Baseball games and is selected by ECAC Supervisor of umpires Nick Zibelli. Collins was second in the Gatemen in batting average with a stellar .293 batting average and recorded one home run with 14 RBI in 35 games. Collins was named to the CCBL All-Star team and caught many of the league’s best pitchers on a Wareham staff stocked with talent. "Being on the Cape has been an unbelievable experience,” said Collins. “I have a great deal of respect for the game and what the people here continue to accomplish year in and year out. From the coaching, guys playing in the league and even its history, the Cape League is so fun place to play baseball. "But it's a tough place to play. All I can really do is come out, work hard and stay focused and hopefully good things will happen. I've played against someof these guys and know what to expect so basically it's all about preparation and calling a good game." At South Alabama, Collins started 64 games, hit .264, slugged two home runs and 31 RBI. He was able to record these numbers as a freshman, the first rookie to start behind the dish for the Jaguars.